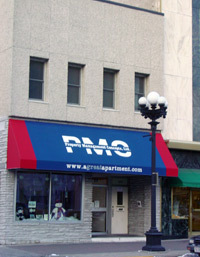 Since 1981, PMC Management Group has been a leader in investment property management, marketing and services in Wisconsin. We specialize in fee management of residential properties, with a limited portfolio of office and retail space. PMC and associated entities manage residential units for business entities worldwide. Our portfolio includes properties throughout Western Wisconsin. PMC’s property portfolio includes luxury apartments and condominiums, quality market standard apartments, Section 42 apartments, single family homes, and duplexes. PMC is well-recognized for our ability to deliver a strong bottom line for our clients and our leadership in rental market research and analysis, enabling timely and profitable rent upgrades. We are well-rooted in the communities we serve, providing sophisticated property management and advisory services often only expected in larger cities. Our quality services create a high degree of loyalty among tenants, who frequently look for properties with the PMC brand when relocating. While relatively small on a national scale, we find our size advantageous in creating long-term relationships with clients, as well as offering clients maximum flexibility in customizing services. COPYRIGHT 2002 - 2019 PMC Management Group All Rights Reserved.